In the largest protest seen in Oakland in decades, more than 10,000 mobilized for a “general strike” in solidarity with “Occupy Oakland” on November 2. That night, a huge column of protesters marched on the Oakland port, shutting it down. A week earlier, on October 25, the city’s streets were a virtual war zone, with an army of riot-equipped cops firing tear gas canisters and other projectiles at 3,000 demonstrators who had come out to protest the police destruction of the Occupy Oakland tent encampment that morning. Video images of Iraq war veteran Scott Olsen lying bleeding on the ground, his skull fractured, while a cop fired an explosive device at protesters trying to rescue him galvanized outrage around the country and around the world. The call for a “general strike” to protest the cop attack was made at an October 26 Occupy Oakland General Assembly of some 2,000 people. The Alameda Labor Council, SEIU Local 1021 city workers, the Oakland Education Association and other unions issued calls to their members to support the action. Speaking at Occupy Wall Street on October 27, Jack Heyman, a former member of the executive board of the Bay Area International Longshore and Warehouse Union (ILWU) Local 10, said that ILWU members would be trying to shut down the port on November 2. There was anger in the ranks of labor against the vicious cop attack on Occupy Oakland, particularly among public workers. Moreover, the working class is burning with its own hatred of the banks and corporations that have busted their unions, savaged their jobs, stolen their houses and made their lives a scramble simply to survive. A mass mobilization of actual union power in defense of the Occupy protesters against police terror would have given the racist, strikebreaking cops some pause. It would also have given the workers as well as the young protesters—most of whom see labor as simply another victimized sector of society—a sense of labor’s unique social power. The workers’ strength lies in their collective organization and above all their ability to shut down production and stop the flow of profits into the coffers of the capitalist owners of industry and the banks. But there was not even the semblance of any mobilization of union power, much less a “general strike,” in Oakland on November 2. Instead, it was left to individual union members to decide whether to work or not. Many workers did take the day off and are proud that they did. But these workers had little organized presence as union contingents. Instead, they were dissolved into an amorphous mass of the “99 percent.” The populist notion that everyone from the workers to students, yuppies and shopkeepers has common interests in opposition to the filthy-rich top 1 percent of this society serves the trade-union misleaders who are so desperate to avoid even the hint of class struggle that they can barely choke out the words “working class.” Behind their cries to defend the “middle class” lie decades of subordinating the workers’ interests to the capitalist class enemy, particularly through their support to the Democratic Party. Last year, Bay Area labor tops, including the leadership of ILWU Local 10, pulled out all the stops to mobilize the ranks to get out the vote for Democrat Jean Quan as mayor of Oakland. Quan had a reputation as a “friend of labor” and supporter of various liberal causes. Now most of her former backers are screaming that she betrayed them by ordering the police attack on the Occupy Oakland encampment on October 25. But Quan was simply fulfilling the job of the city’s chief executive office and commander-in-chief of the Oakland police. As former San Francisco mayor Willie Brown explained in his column in the San Francisco Chronicle (30 October), when Quan became mayor she was no longer a “street activist” or even city councilman: “Once you assume the responsibility and you take the oath of office, you have to make it clear to your mother, your father and your supporters that you’re going to operate in the public’s interest.” The “public interest” is a code word for serving the interests of the capitalist class. Some Democrats in Oakland and other cities continue to push for the cops to remove the Occupy encampments. Others, like Congresswoman Barbara Lee, who pledges her support to “peaceful protesters in this struggle for economic justice,” see an opportunity to boost the Democrats’ electoral fortunes. Here again the Democrats are served by their loyal foot soldiers in the labor bureaucracy. Having done virtually nothing to defend even their own members against the capitalist rulers’ relentless union-busting assaults, the union misleaders now embrace the Occupy movement. They supported the call for a “general strike” precisely because it wasn’t one. Left-talking ILWU Local 10 executive board member Clarence Thomas, who was a prominent spokesman for the November 2 action, lauded the fact that the “general strike” call had come not from labor but from the “grassroots.” This was merely a convenient ruse to cover for the fact that none of the union tops, including the more “militant” ILWU bureaucrats, mobilized their ranks in labor action. On the day of the rally, Jack Heyman announced from the podium that ILWU members had refused to take jobs and had effectively shut down the port. This was not the case. As Clarence Thomas said in an interview that day, it was “misinformation.” While a leaflet signed by Heyman, Thomas and a few other ILWUers calling to “Defend Occupy Oakland with the Muscle of Organized Labor” was given big play by Bay Area rad-libs, the membership of the union was never mobilized to take any such action, or even much informed. Many longshoremen did take jobs, and the port was not shut down during the day. Thousands of protesters did shut down the port that night. But the politics that drove this action was not qualitatively different from the “no business as usual” liberalism of the rest of the rally, precisely because it was not an action carried out by labor. It did nothing to advance the consciousness of the workers, nor of the protesters, of labor’s class power. Instead, protesters were left with the idea that all they needed to do was to set up a picket line and the workers wouldn’t work. The workers were relegated to a subordinate role, subsumed under the populism that dominated the overwhelmingly petty-bourgeois protest and that was pushed by all the union bureaucrats, including those of the ILWU. Much was made of the November 2 action as the first “general strike” in this country since the 1946 Oakland general strike, which was part of the largest strike wave in U.S. history. The 1946 strike was sparked when workers walked out in protest against police herding a convoy of scab trucks with products for two major department stores that were being struck by women workers. As described by Stan Weir, a supporter of Max Shachtman’s Workers Party and a participant in the strike, “truck drivers, bus and streetcar operators and passengers, got off their vehicles and did not return. The city filled with workers, they milled about in the city’s core for several hours and then organized themselves” (“1946: The Oakland General Strike,” libcom.org). That included shutting down all stores except pharmacies and food markets; cordoning off the center of the city, directing traffic and only allowing those with union cards in; forming flying squads of workers to patrol against any strikebreaking activity. That is what the mobilization of labor’s power in an actual general strike looks like, not some one-day protest to blow off steam like regularly takes place in many European countries and not what took place in Oakland on November 2. Whatever may be the spark for a general strike, when workers shut down production and run various aspects of society themselves, their action poses the question of which class shall rule. The 1946 strike also clearly demonstrated the commitment of the labor bureaucracy to the maintenance of the capitalist order. The American Federation of Labor and Central Labor Council leaders worked overtime to keep the strike contained. Dave Beck, the vice president of the Teamsters union at the time, denounced the general strike as “nothing but a revolution” and ordered Teamsters to break the strike. Local union leaders made a settlement with Oakland city officials to end it. The workers went back to work, their strike sabotaged by their own misleaders. The Occupy protests have tapped into the widespread anger of many against the increasing destitution brought on by the worst economic crisis since the Great Depression. But the populist notion, promoted by many in the petty-bourgeois Occupy movement, that the struggle is to “reclaim our democracy” from greedy bankers and corporate magnates is not only false but dangerous. This country was founded on the enslavement of black people and the genocidal annihilation of Native Americans. Its history is riddled with the bodies of working-class fighters killed at the hands of the police or the courts. The banks and corporations didn’t hijack the government in the last couple of decades or with the onset of the Wall Street crash. The purpose of this government has always been to defend the property and profits of the ruling class. The wealth of this country is actually overwhelmingly concentrated in the handful of families—far less than 1 percent of the population—that own the corporations and the banks and whose profits are derived through the exploitation of labor. This capitalist class runs both the Democratic and Republican parties, whose main difference is not what they do but how they do it. The Republicans make no bones about being the party of “big business” in viciously going after the working class, blacks, immigrants and the poor. The Democrats lie and do the same thing. The “choice” at election time is simply which capitalist party will oversee the brutal repression of the working class and oppressed at home and prosecute U.S. imperialism’s bloody wars and occupations abroad. America is ruled by a single class—it is the dictatorship of the bourgeoisie. The facade of democracy serves to obscure the fact that the capitalist state is an instrument of organized violence—consisting at its core of the police, military, courts and prisons—for maintaining capitalist rule. The Occupy movement largely expresses a cry of rage by white, petty-bourgeois youth as the avenues that they thought would be open to them after going thousands of dollars in debt for a college degree are increasingly closed. From their vantage point, this is an abrogation of the promise of the “American dream” with its attendant, if threadbare, Horatio Alger myth that those who study and work hard will prosper. For the working class, the idea that their children would have a better future than themselves has receded further and further out of reach. And for black people in this country, the American dream has always been a nightmare. Class divisions and racial fault lines rend the Occupy movement’s much-vaunted 99 percent. Their populist appeals reverberate less among the largely black members of Local 10 than they do among teachers and nurses. As one minority activist, who is sympathetic with Occupy Oakland, put it in describing the attention this movement has received: “It’s the Columbine phenomenon. When it happens to white people, it becomes news. This has been happening to people in my neighborhood all the time” (Oakland Tribune, 2 November). Occupy Oakland named its encampment after Oscar Grant, the young black worker who was shot down in cold blood by a BART cop early on New Year’s Day 2009. This is a statement of solidarity and recognition of the reality of racist cop terror. But the slogan “we are the 99 percent” falsely puts forward the idea that all those not in the top 1 percent have common interests. This was picked up by the Oakland Police Officers’ Association in a sinister letter to “the citizens of Oakland” on the eve of the November 2 protest. Declaring “we, too, are the 99% fighting for better working conditions, fair treatment and the ability to provide a living for our children and families,” the letter ended with an appeal for “real leaders NOW” to back them up in doing their job—from lobbing tear gas grenades at protesters to strengthening their power as a racist occupying army in the Oakland ghettos. The cops, who had largely been held in reserve on November 2, were itching for the opportunity to bust some heads. And at the end of the night, the police once again launched an assault on protesters in downtown Oakland, rupturing the spleen of yet another Iraq war veteran and arresting over 100. Echoing city authorities, protest organizers have launched a hue and cry against “violent” anarchists. This serves only to alibi the cops. In fact, the anarchists share the liberal politics of the organizers of the Occupy movement, simply giving them a (generally infantile) “streetfighting” veneer. All opponents of police terror must demand that all charges be dropped! That means rejecting the notion promoted by many in the Occupy movement that the cops are potential allies. The attacks on Occupy Oakland have given the protesters a bloody taste of the police terror and repression that is an everyday fact of life for blacks in the inner cities of this country. Any worker who engages in struggle to defend his union, job, wages and working conditions gets a lesson in the class nature of the capitalist state. The march on the Port of Oakland on November 2 was promoted as being in solidarity with ILWU workers battling the giant EGT grain-exporting consortium at the port of Longview, Washington. In the fight to defeat EGT’s union-busting drive, ILWU members have been brutally assaulted and arrested by the cops and the union has been hit with massive fines by the courts. The workers have fought back, as seen in the mass picket set up on September 8 to stop trains carrying grain into the terminal, backing off the cops and the company’s security thugs (see “ILWU Fights Deadly Threat,” WV No. 986, 16 September). This battle gave a small, if real, taste of the power that lies in the hands of the working class. For Workers Revolution to Expropriate the Bourgeoisie! In a 4 November Liberation editorial titled “The Movement We Need for the Society We Deserve,” the Party for Socialism and Liberation (PSL) argues that despite the “problems” of the Occupy movement, “revolution is a process. Liberal movements become radical and then revolutionary as they are confronted with new challenges, obstacles and needs.” To be sure, many people are propelled into struggle in opposition to the injustices of this society while still being animated by the liberal notion that this system can be reformed to address the needs of “all of the people.” But such movements do not become revolutionary simply through the course of struggle. On the contrary, the movements of the past—from the civil rights movement to mass protests against the Vietnam War—demonstrate that those who do not break from the liberal belief in the inherent, if supposedly abused, “democracy” of capitalist America will for the most part end up serving it, usually as part of the Democratic Party. That self-proclaimed “socialists” like the PSL, the International Socialist Organization and others laud the Occupy movement is a statement of their commitment to reinforcing the deadly illusion that this government can, with sufficient pressure, be made to serve the interests of the many as opposed to the profits of the few. Some young militants in the Occupy movement will no doubt be propelled into questioning the nature of this society and the state. Our purpose is to win such individuals to a revolutionary Marxist worldview based on the understanding that this system cannot be reformed but must be abolished, and that the only class with the social power and historic interest to do so is the working class. It is small wonder that few, if any, in the Occupy movement have any sense of the class power of the workers. For decades, thanks to the misleaders of labor, working people have suffered one defeat after another. Organized labor has been reduced to little more than 10 percent of the country’s workforce, while the masses of unorganized are ground into further destitution. To transform the unions into bastions of class struggle on workers’ behalf and on behalf of all the victims of the capitalist rulers requires a leadership that begins from the understanding that the interests of labor and capital are irreconcilably counterposed. 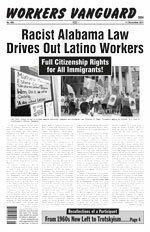 The fight for a class-struggle labor leadership is integral to building a multiracial revolutionary workers party that would champion black freedom, full citizenship rights for all immigrants, women’s liberation and the cause of all the oppressed. Such a party is the critical instrument for leading the battle to sweep away the barbarism of capitalist class rule through proletarian socialist revolution.